That special something for the car lover in your life. 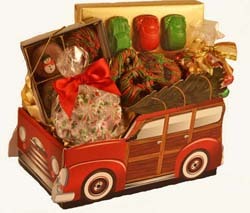 This woody station wagon gift is a show-stopper, loaded with nostalgia and all your favorite Dorothy's goodies. Special bonus -- three hand-painted chocolate cars decorate the deluxe assortment box. If you have a special recipient who loves tradition, cars or Christmas. Anybody you know?